TSS are specialised off-grid system integrators, specialising in solar and hybrid systems. They work especially on critical applications, like telecoms networks, which sit off-grid but need reliable uptime. TowerXchange took some time to interview TSS’s Sales & Marketing Manager for Telecom Erik Blokhuis to find out more about how solar systems are offering improved capex and opex compared with diesel-led solutions. TowerXchange: Please introduce your company – where do you fit in the telecoms infrastructure ecosystem? "We were founded in 2003 by ex-Shell Solar engineers, people who had been working in solar since the early 90’s. So the calibre of expertise here has been high from the very beginning. We don’t just focus on the solar panels alone but are pushing the envelope technically, rather in the commercial applications of solar technology as a primary energy source. We create highly reliable solar and hybrid systems, take full system responsibility in delivering a functional and reliable solar system in a project, from design, engineering delivery and commissioning. All in collaboration with our client, and always tailored to the site’s requirements." TowerXchange: Please tell us about the performance of your solution in the field – who is using it and what results have been achieved? What is your installed base at cell sites worldwide? "Over the last 15 years we have installed over 1,100 sites across Africa, Southeast Asia, the Middle East and Europe. Most of the work we do is to provide reliable power for remote telecoms units. And to be clear, we’re a solar energy driven company, we believe in renewable energy technology and its benefits and it is at the core of what we do. Lots of the time these have been within the oil and gas sector where reliability is paramount for mission critical and remote applications." "We want to minimise points of failure and guarantee the uptime our clients expect. We ensure long battery lives and minimum service intervals by doing a proper system sizing, using fewer components, and less complex designs. This reduces the points of failure. Fewer components mean less capex, and fewer points of failure means lower maintenance opex. This is what gives us our high reliability and a better total cost of ownership (TCO). As we are an engineering and system integration company, specific client requirements can also be taken into account." "I can provide a few examples. In Algeria, we installed a number of off-grid solar systems last year with custom designed three meter high solar module support structures to mitigate the existing theft risks in that area. We recently also got awarded another project in Algeria for 45 off-grid solar energy systems. Those systems will be installed on 15 meter high monopoles, also as an anti-theft solution." 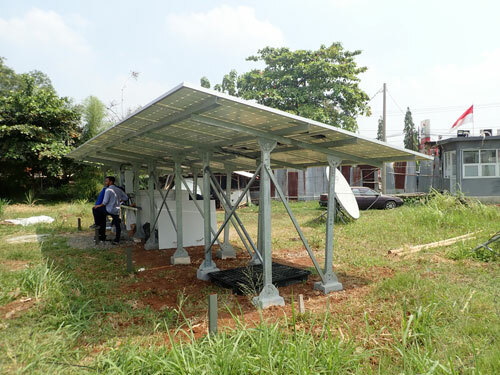 "For a VSAT service provider in Indonesia last summer we installed and commissioned a 500W stand-alone solar energy system with 96 hours (four days) of battery autonomy and a simple network management protocol (SNMP) uplink to their network operations centre (NOC). This helped demonstrate the reliability of solar and battery back-up versus using diesel gensets to the local authorities involved in the project." TowerXchange: You engage with customers from design and project management to training, remote monitoring and system integration – please talk us through a “typical” collaboration between TSS and a cell site owner. "As an off-grid solar system integrator we take full responsibility for the complete system in a project, but there is no one-size-fits all solution or configuration. We work with the client to establish what they need from their sites in terms of performance, whether they need a pure solar system, or zero-diesel solution as you could call it, or something hybridised and then we get to work. There’s lots of room for optimisation based on the individual site specifics or client’s specific needs." "We recently developed a new solar module support structure, specifically designed to reduce handling and transportation costs and to support local manufacturing in Asia or Africa. We don’t see the added value of shipping support structures from Europe to those markets and there is also an increasing preference or regulatory requirement for local content in those markets." "The on-site installation can be either undertaken by the client themselves, their preferred local third-party contractors, or TSS selected local third-party contractors. The installation will be overseen on-site by a TSS field service technician who will be doing the commissioning and hand-over to client." "Remote monitoring and control is paramount to effectively managing remote off-grid telecom installations. TSS have developed a flexible and customisable cloud-based remote monitoring and control application together with one of our IT partners. 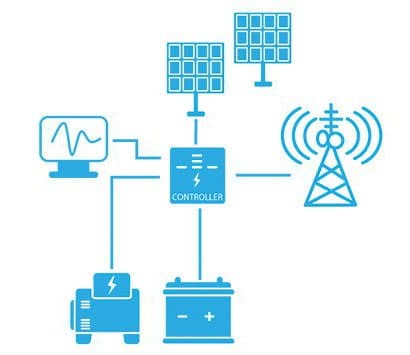 This solution allows our clients to cost effectively monitor and control the TSS solar hybrid systems 24/7 remotely from any internet connected device. We also enable clients to feed our systems data directly into their own Network Operations Centre software." TowerXchange: The most frequent complaint about solar power systems TowerXchange hears from towercos and MNOs is that they can be too complex for their current field service partners to effectively maintain. How do you overcome such concerns? "We do provide training, so that maintenance teams in the field can understand our systems, but honestly the maintenance requirement for our solar and hybrid systems are minimal. That’s how we’ve designed it, to keep it simple. Things can be a bit more demanding in terms of maintenance requirements if there’s a diesel generator involved, but if you just have solar panels and storage batteries there should be very little to maintain and very little should go wrong. You would just need to clean the solar modules periodically. It does not get any simpler, really." "Our solar systems are passive cooled energy systems. We have no active cooling systems and fans and no moving parts, so wear and tear is limited and the internal energy consumption is extremely low. There are also less systems parts that can fail. Maintenance involves tightening a few battery and support structure screws and employing a cleaning company to keep the solar panels clean and at full capacity. We really wanted to minimise last mile risk. Plus, we also only work with Tier One vendors in the markets in which we operate so local maintenance support is covered." "We see a transition in the telecom market to move from diesel based off-grid energy systems towards “zero diesel solutions.” However, until today the large majority of stand-alone solar power systems installed in the telecoms market apparently do not run trouble-free 24/7 throughout the year. Expected battery lives are not met either, negatively impacting upfront TCO and ROI calculations. As a result, quite a few MNOs and towercos consider solar with batteries unreliable and still prefer diesel gensets as a mandatory back-up despite the associated high maintenance and fuel costs." "However, we would say, and have proven over time, that a well-designed and correctly sized solar energy system with battery storage can be highly reliable, hardly requiring maintenance and minimising opex, making a good business case for the additional capex." TowerXchange: What’s the sweet spot for your solutions in terms of grid availability and the load your solutions can support? "We focus exclusively on off-grid applications and areas with very unreliable grids. But in terms of sweet spot for installed sites, we can run standalone solar and battery combinations to any capacity, the only limiting factor is space." "For example on towers with multiple tenants you increase the energy demand but also minimise the space on the tower on which you can install solar panels. For single tenant towers, with energy demands up to 1kW or 1.5kW continuous, it is very straightforward to deploy the pure solar solution." "Alternatively for sites with higher energy demand we can install solar modules on the ground at the site and when there is not enough space the hybrid systems come into play, and secondary energy source can be a diesel generator set, or it could be wind or any other energy source. We are flexible and look at the optimum solution per site." TowerXchange: How many hours of sunshine is necessary for your renewable energy solution to start to become a viable option? How is increasing solar cell and battery efficiency affecting that? "Any site between the two tropics with high solar irradiation is a good site, but we have also installed quite a number of sites in Europe. That might involve using more solar modules, changing the tilt angle for optimal solar yield, but the solution is flexible. Solar module efficiency is improving and that helps us produce more energy on a restricted amount of space." "An example of supporting higher solar efficiencies and lower internal energy usage are the TSS in-house developed charge controllers; they are world leading for use in high temperatures and harsh environments without any de-rating and without forced cooling as offered by other vendors. The increasing efficiency of solar modules have made us redesign a new version of our TSS charge controller to harvest the maximum solar energy, supporting our client’s ROI and TCO targets." "As batteries are the big ticket items in a solar energy systems, we continuously strive to achieve the best battery lifetimes for our clients to guarantee the system performance and to secure their investment. Therefore we continuously test and enhance our TSS battery charging regimes in close cooperation with battery OEM’s like EnerSys and Saft." TowerXchange: What magnitude of fuel and O&M savings can be realised using your solutions, and how does TCO compare with traditional diesel-oriented energy solutions over an eighteen month, three year and five year scenario? "With rising fuel prices, environmental concerns and increasing pressure on opex reduction, the business case for solar based energy systems is getting better and better." "To give you an indication, for sites up to 1kW and 1.5kW continuous load, the ROI for a stand-alone solar with batteries system can be as low as one year compared to a 24/7 running diesel generator. Maintenance visits are generally reduced to just once every six months to one year depending the location, and diesel cost is completely eliminated." "Above 1.5kW continuous load, the ROI for solar diesel hybrid solutions can be anywhere between two to five years maximum depending on the actual site load, solar irradiation, fuel costs and local logistical conditions and costs. With fuel subsidies been significantly reduced nowadays in many countries including the Middle East, deploying solar is a good measure to mitigate the opex risks of these future fuel price hikes." "To give you a real life example, the diesel runtime and fuel consumption reductions we have observed in our solar diesel hybrid trial project in the Middle East are excellent. Compared to a typical 15kVA diesel genset running continuously and directly connected to the load, we have achieved on average 91% reduction on runtime and over 83% on average reduction on diesel consumption. The number of site visits based on runtime and refuelling have been reduced from once every month to just once a year. Compared to a typical 15kVA DG+Batteries solution running eight hours cyclic per day at 80% load, the average runtime reduction we achieved is close to 80% and the average fuel consumption reduction 50%. The number of site visits based on runtime and refuelling have been reduced to just once a year instead of four times a year based on a 250 hours’ runtime service interval." "The advantage of deploying solar goes further than just opex reductions. It allows the reduction of site visits which directly reduces the health and safety risks associated with the crew’s mobilisations and demobilisations. As health and safety is an increasingly important KPI for companies nowadays it strengthens the case for deploying solar." TowerXchange: SLAs often demand 99.5% or higher uptime – tell us about the reliability and autonomy of your solution and your after sale advice and remote monitoring services. "TSS’s core business is supplying solar based energy systems to mission critical applications where uptime and reliability are of paramount importance. In order to ensure operations we have a unique fall-back functionality incorporated in our charge controller which kicks in should the digital controls fail. This mode extends the reliability of the system and provides the operator more time to get to the site. Besides this we can also offer a dual set up which allows to switch off 50% of the system for maintenance purposes while the other 50% still provides energy." TowerXchange: How is your solution scalable to accommodate the increasing power requirements as multiple tenants are added to a site? "If there is enough space on site to install additional PV modules to increase the amount of solar output then that will always be the preferred choice. In Gabon for example, the client’s load has increased over the years so we have upgraded the system three times. If the increased load is within the foreseeable future, the best thing to do is to factor in a percentage spare capacity to cater for future increased load requirements. For multiple tenant sites, which are generally above 1kW continuous load anyway, a solar diesel hybrid system will be deployed, and the increased energy demand can be either provided by additional PV modules or by increasing the diesel genset runtime or adding a wind turbine for example." TowerXchange: Please sum up how you would differentiate your solution from your competitors’? "Off-grid solar has been our core business for the past 15 years and we have a proven track record of over 1,100 off-grid systems reliably running all year round in the most remote and harsh environments. We have 100% passive cooled solar energy systems that reduces maintenance and energy usage. We continuously test and enhance our battery charging regimes to get the most out of our batteries. We are so confident of our capabilities that we actually are happy to discuss with our clients providing them performance output guarantees for as much as long as seven years. To finish, I’d like to call upon the MNOs and Towercos to challenge us with their off-grid energy issues!"